Yesterday we took a tour into the DMZ (De-Militarized Zone) and the JSA (Joint Security Area) between North and South Korea. It was absolutely stunning and amazing to see in person what I’d only before read about (half-heartedly at that) in history books. It’s tough to put into words the emotions that went along with the experience. So instead, I’ll post a picture of an embarrassing blunder some poor UN Commissioned South Korean soldier made outside the briefing area at Camp Boniface in the DMZ. 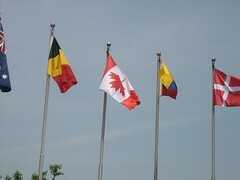 As the wind picked up, we noticed that the Canadian Flag had been hung upside-down! As we’re both reasonably attractive, and blonde Caucasians, we tend to attract a lot of attention in Korea. That day was no exception, and within seconds of pointing, snickering, and taking the picture, the guard (who’d obviously been watching us) strode purposefully over and righted the Maple Leaf. Saving Face, always presenting a positive image, and basically appearing perfect all the time is a HUGE part of Korean culture, so it was doubly amusing that the soldiers had made such an obvious blunder in a place that exists mostly for the benefit of visitors to their country. Being the benevolent Canadians that we are, we didn’t kick up a fuss about the flag or anything – we’re just not a terribly sensitive people like that. But I’d really like to see what happened later that day to the doofus who put the flags up that morning! Isn’t flying the flag upside down punishable by death…hmmm. It just reminds me that no, it isn’t perfectly obvious to the world that the maple leaf is a LEAF and therefore the stem points down. I’m sure soldiers in Korea have much more important things to remember. Now.. imagine what would have happened if it had been the US flag. International incident anyone? Next Next post: And so it ends.